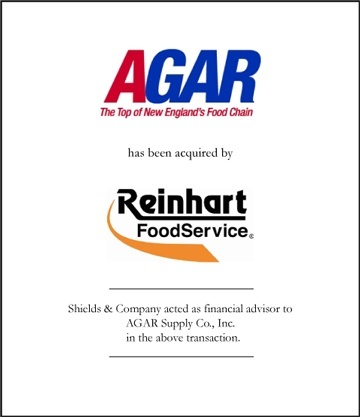 Shields & Co. negotiated and facilitated a successful sale of AGAR Supply Co., Inc. to Reinhart Foodservice, LLC, one of the most progressive and efficient broadline foodservice distributors in the United States. The company provides fresh produce, proteins, ingredients, supplies and equipment to customers across the U.S. from 27 state-of-the-art distribution centers. Agar Supply Co, Inc., based in Taunton, Massachusetts, is New England’s largest independent food distributor and the twelfth largest in the United States. AGAR offers a wide range of solutions for the food service industry. The company is New England’s premier supplier of meats, poultry, seafood and grocery items as well as dairy products, non-perishables, non-food items, janitorial supplies and small wares. AGAR distributes popular national brands along with being the exclusive distributor of the Nautifish® Seafood brand and the portion cut marinated meats and poultry brand Bull Pen®. Shields & Company acted as a financial advisor to AGAR Supply Co., Inc. in the above transaction.